In the last 100 years, 'Terra Australis Incognita', the 'Hidden Southern Land', has been slowly unveiling its secrets after spending a lifetime in forbidding silence. It's 14 million square kilometres of ice and snow is described as being the driest, coldest and windiest place in the world. Yet, undeniably, this cruel continent commands an air of awesome significance and supreme beauty. 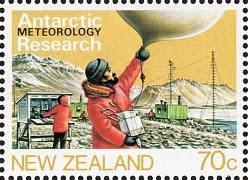 On the southern most tip of Ross Island, located on the edge of the Ross Ice Shelf on the Antarctic continent, is Scott Base, established in 1957 to support New Zealand's participation in the International Geophysical Year scientific research programme. Since then it has been continuously occupied by scientists and support staff. 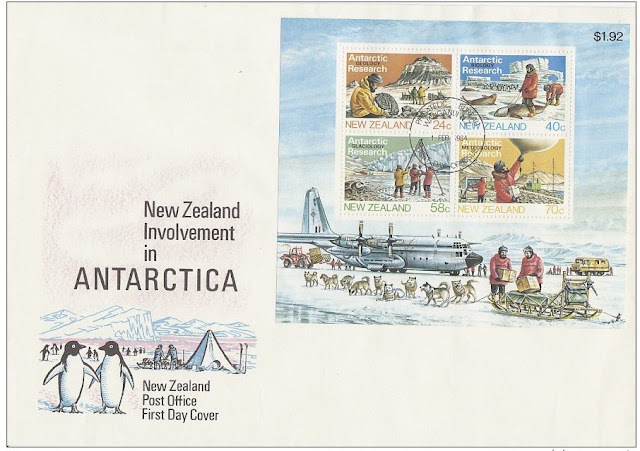 Other bases have been established including Vanda Station on the shores of Lake Vanda in the Dry Valley region of Victoria Land on the Antarctic continent proper, and at Cape Bird on the northern tip of Ross Island, 100 kilometres from Scott Base. The seasons govern the population and the work carried out but always the base is manned. 24c - Geological Research - at Shapeless Mountain. 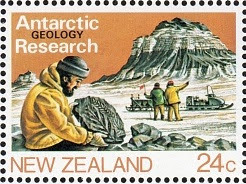 Studies carried out by New Zealanders in the Ross Dependency have led to a great variety of fossil discoveries. These remnants are evidence of the likely measure of mineral deposits they can expect to find in this land. 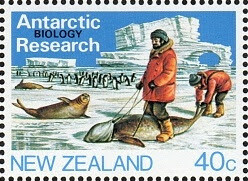 40c - Biological Research - Seal Colonies. 58c - Glaciological Research - 'Winkle' Drilling. 1984 Antarctic Research Miniature Sheet. I really like this miniature sheet. It shows an NZRAF C-130 Hercules being unloaded on the ice near Scott Base. Nice mixture of modern transport equipment with a dog team in front. 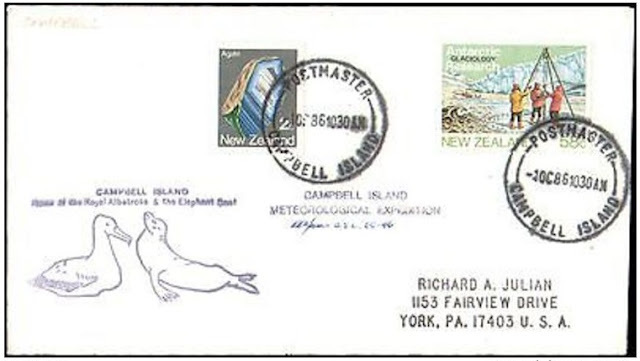 First Day Cover showing all four values. 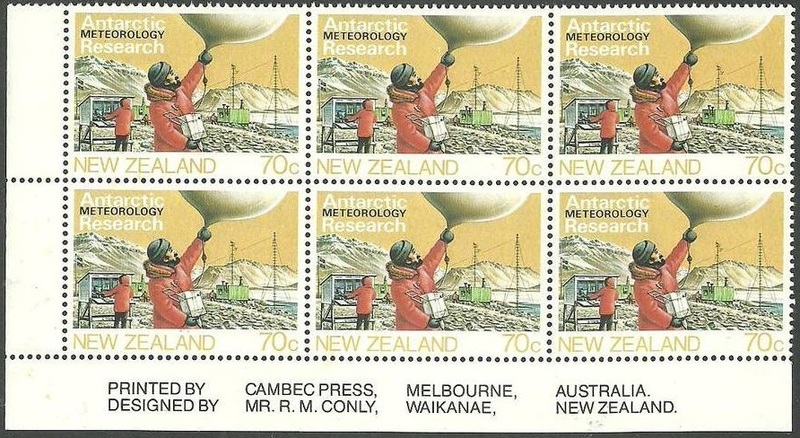 Miniature Sheet on a First Day Cover. 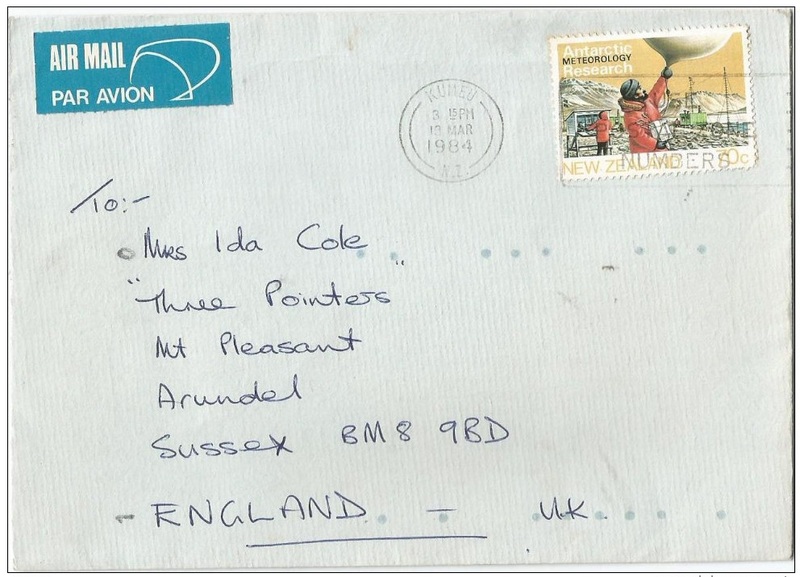 This is not a FDC but just an example of the 70c value on a cover being sent from Kumeu, North/west of Auckland to Sussex in England. Of course, this is possible because this issue is a normal New Zealand stamp issue but if it had been a Ross Dependency issue then the stamp would have been invalid for postage in Kumeu. Plate block set for this issue. Four nice clean plate blocks, one of each value, showing the bottom left corner selvedge with the designer and printer. 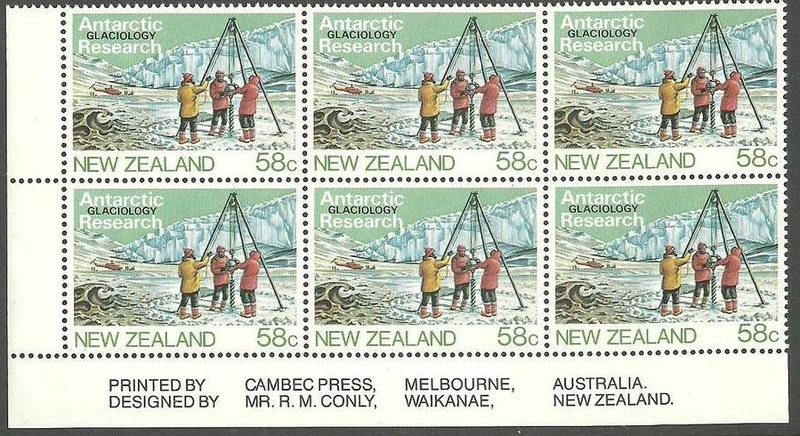 1984 24c Antarctic Research Plate Block of 8 stamps. 1984 40c Antarctic Research Plate Block of 8 stamps. 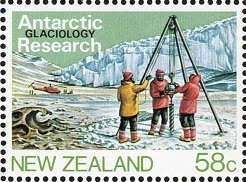 1984 58c Antarctic Research Plate Block of 6 stamps. 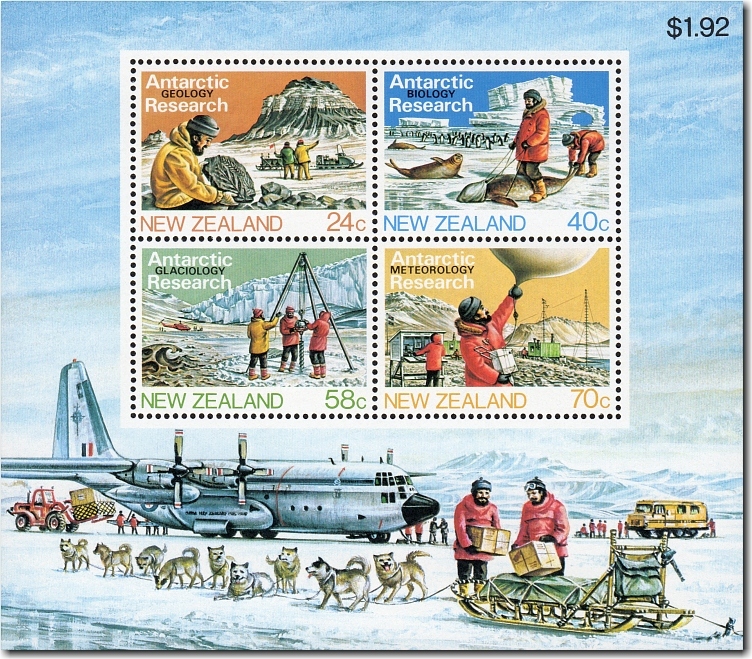 1984 70c Antarctic Research Plate Block of 6 stamps. 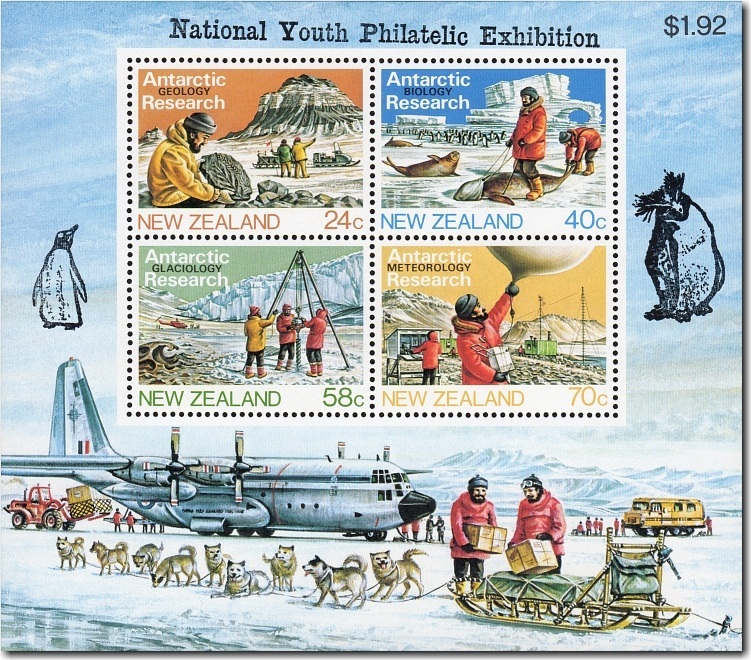 A quantity of the miniature sheets were overprinted with 'National Youth Philatelic Exhibition' cross the top and a penguin on either side to support the Stampex '85 National Youth Philatelic Exhibition which was held in Christchurch from the 29th of August to the 1st of September 1985. The quality of the overprint is quite variable n quality. A 1986 cover sent from a scientist on Campbell Island with the 1984 Antarctica Research - 58c stamp.